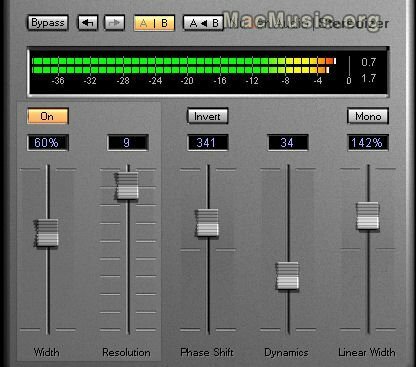 NuGen Audio has released version 2.6 of Stereoizer in both Mac OS X VST/AU and Windows VST formats, featuring an updated GUI and several control enhancements. Stereoizer is designed for adding adjustable stereo spread to mono or stereo input signals. Stereoizer can generate the full range of stereo enhancement, from subtle depth control to full dynamic shifting and phase realignment. Great for percussion parts, lifeless pads, static lead sounds - anything that needs that little bit extra. Originally available for Windows Stereoizer is now also available for Mac OS X in VST and Audio Units formats. It costs $39 and demo versions are available. * Integrated peak-hold level meter. * Direct numerical parameter entry. * Primary algorithm on/off control.